Since the Playground Electronic Gaming space opened on December 13, over $625K were paid in Jackpots alone. In just six weeks, over 150 guests were hand-paid a sum of at least $1,000, including Luigi B, winner of our biggest Jackpot to date: $30,222.70! This week, our 3 biggest Jackpots were hit within a 24-hour period. On Tuesday night, Guylaine Gregory was playing Quick Hit Platinum Plus, betting $6 per spin. At 9:24PM, her screen showed 8 Quick Hits and filled with golden coins. Moments later, she was hand-paid $4,382.82! The following afternoon, a gentleman by the name of Pierre was also spinning Quick Hit Platinum Plus, the same version of the Quick Hit game that paid Guylaine a handsome amount. He was also max-betting at $6 a pop, and at 4:24PM, became the proud winner of $4,380.20. A few hours before that, a young man named Jonathan Boulay was playing Quick Hit, the classic version of the same game. He got into Free Game mode, and one of those unlocked a Jackpot that changed his day for the better, to say the least. He confided that he had a car accident in the morning and after opting to take the day off, came to Playground with $200 to take the edge off. On his last $20 bill, he hit a $3765,05 Jackpot. What a turnaround! It was great to see three people get lucky in such a short period of time; double great to see Jonathan catch a break after such a trying day. 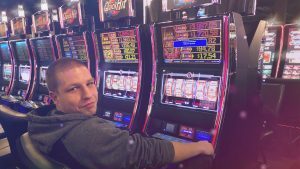 All three of them found good fortune in one variation or another of our Quick Hit machines, the same game that holds the current Playground record for biggest EGD Jackpot.